1. Have I done the right amount of research? 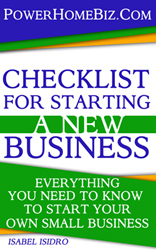 The excitement of starting a new business can cause small business entrepreneurs to be too hasty. Often driven by the mistaken belief that some imaginary boat will be missed if the business isn’t started NOW, this haste can result in the cutting of corners, particularly in the area of research. Research – whether into potential markets, the activities of competitors, the mechanics of the business, financial projections or methods of marketing – is essential when completing a realistic and comprehensive business plan. On a contrary note, too much research can signal and fuel procrastination. Many prospective business owners remain just that – prospective – rendered motionless under the weight and anxieties caused by research excess. How do you find the happy medium? Draft a research plan by listing the headings that you feel need attention. Then discuss this with 2 or 3 business friends or associates and gather their opinions (and no, not the ones who you know will agree with everything you say!). 2. Have I been realistic about the pitfalls? Read any book about entrepreneurs and you’ll find the word ‘risk’ somewhere near the beginning. Every new business has an element of risk, often it’s risk that precedes revolution and it’s revolution that can bring huge success. However, there’s a distinction between risk and irresponsibility. In a nutshell, risk is not usually terminal. Sure the business itself might fail, but the possibility of loss will have been foreseen and personal disaster will generally have been avoided. Irresponsibility on the other hand generally indicates that pitfalls have been blatantly ignored. When risks takers don’t pull it off, it’s onto the next. When the irresponsible fail, it’s lose everything and head back to employment. A classic scenario is the entrepreneur fired-up with the most unique, groundbreaking business idea ever. “It’s what the World has been waiting for?’ we hear, “no-one has ever done it like this!” Er, why? Unique, groundbreaking ideas are fabulous, alas they seldom translate into successful businesses. Far better to do what others have done, learn from their lessons and do it better. 3. Am I cut out to working on my own? Working for yourself sounds like bliss and to many it is. To others, however, it’s lonely, isolating and downright destructive. In what way may my behaviors sabotage my business? Will I interact with enough people during the week? How will I delineate between work and play? 4. Can I handle administrative tasks AND develop my business? “How did I get here?” is a far too common complaint of the small business owner. Just a few months into the business and the optimism of the pre-launch period has been replaced with mountains of paperwork and endless action lists. At this point, days go by where little is achieved other than a run to the Post Office or a drop off to the bank. This can be due to insufficient thought being given to the mechanics of the business, insufficient notice taken of early signals or (most commonly) a lack of formulating procedures. Michael Gerber’s book, The E-Myth, is a great introduction to this topic and followed closely, can be a good support through the jungle. This is the part of starting out on your own that few people envisage. Don’t let it defeat you. Conquer this effectively and you’ll be back in control with a business that’s better equipped. If you need external help, consider retaining a coach for a short period. 5. Do I have sufficient financial reserves? Commonly, start-ups are under funded. There’s simply insufficient reserve to survive the development period. Here we see the new owner opting for the “she’ll be right” seat of the pants approach to business – not a sensible strategy. Of course occasionally we hear of an under-capitalized business that launches and succeeds effortlessly. But ever wondered why it’s so newsworthy? Imagine trying to promote, market and network your business when you’re anxious about whether you’ll meet the next rent payment. Not only is it very personally draining, it becomes very apparent to others that you’re in difficulty. It’s a harsh reality, but few want to give custom to a business that appears to be failing. Make sure you have the funds to ride out the storm. In conclusion, much is spoken of the high percentage of small businesses that fail. Don’t let yours become a statistic. Do your preparation and get ready for the best journey of your life!